Was elected the second President of the Republic of Armenia in early presidential elections on March 30, 1998. 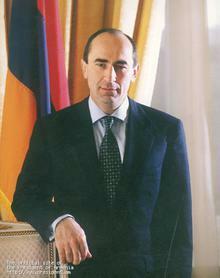 Was reelected to the post of the President of the Republic of Armenia on March 5, 2003. Robert Kocharian was born on August 31, 1954, in Stepanakert. He received his secondary education in Stepanakert. He served in the Soviet Army in 1972-74. In 1982, Robert Kocharian graduated from Yerevan Polytechnic Institute’s Electro-Technical Department with honors. On March 5, 2003, Robert Kocharian was reelected President of the Republic of Armenia and was in office until 2008.